Most business travelers claim that they have the best job in the world, and they don’t mean work in a comfortable office situated in the city center. We are entering the era of a modern business model. People understand that during travel there are many opportunities that can positively affect their career and life in general. Time spent on flights and stays in a hotel is not lost working time, but an additional opportunity to expand business horizons. Therefore, if you plan to visit Florida for business needs, we are ready to offer you 5 luxurious hotels that provide modern amenities and all the necessary conditions for effective work. What’s more, here you can rent a car for transfer from the airport. For a diverse and comfortable stay at JW Marriott Marquis, guests can enjoy spacious rooms overlooking the bay. All rooms have high-quality modern furniture, a large TV panel with cable channels, and a separate living room with a sofa area. Tea-making facilities create special comfort. On site guests can use the spa, as well as a large swimming pool area and a fitness room. A bowling club complements the selection of services. The fans of this game can spend time there, occupying the lane and ordering soft drinks. For business travelers, there’s a service center with everything you may need to work even on a trip. Delicious and varied food is provided by the cuisine of the hotel’s own restaurant. Having taken a table near the panoramic window, you can order American classic snacks and French dishes, watch the life of the coast or the colorful lights of the night Miami. The whole atmosphere of the hotel is very stylish and modern. The staff is polite, so you will feel quite comfortable there. This is a luxurious beach hotel with apartments overlooking the coast. In all rooms at the Ritz-Carlton Coconut Grove, the special atmosphere of comfort is created by elegant interior and mahogany furnishing. The rooms are equipped with spacious bathrooms, the walls and floors of which are decorated with marble slabs. Each room has a balcony overlooking Biscayne Bay. The range of services of this elegant hotel in Miami is complemented by its own spa, where guests can undergo a cycle of anti-aging treatments or simply spend time in harmony and pleasant surroundings. The hotel has a large outdoor swimming pool for guests, and next to it there’s a restaurant, whose chefs specialize in Italian dishes. In the spacious and very cozy lounge area alcoholic and non-alcoholic drinks, desserts, snacks are served in the evenings. The hotel provides the conditions for doing business. In order to perform the necessary financial operations, use laptop or presentation equipment in the business center on site. The hotel occupies a modern high-rise building, which has more than 200 rooms with large, comfortable beds, TVs, and a bathroom. The beach is within easy reach of Atton Brickell. 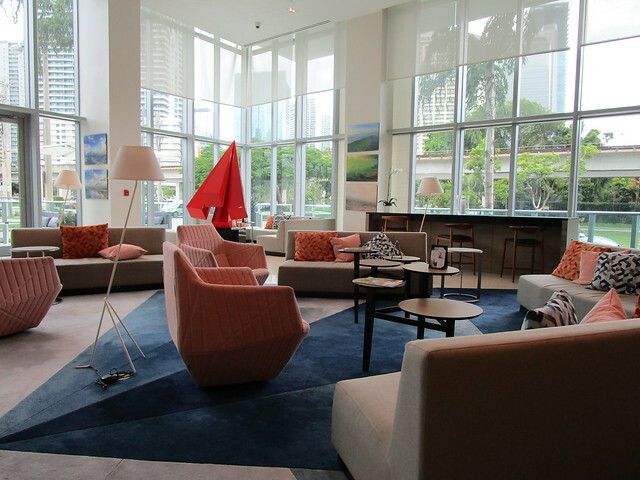 Having stayed at this luxurious and modern hotel, you can quickly reach such popular travelers’ places as, Vizcaya Museum, American Airlines Arena and Brickell shopping center. 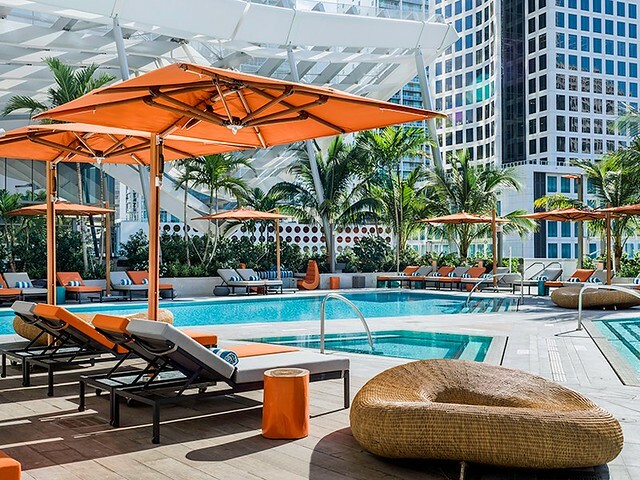 Like many hotels in Miami, the complex has its own large swimming pool, fitness room, which is popular among athletes and people who like keeping fit, as well as a restaurant and lounge area with comfortable sofas and a bar. The hotel’s restaurant serves dishes of American and classic European cuisine. Convenient location is another advantage of the hotel. It’s surrounded by the entertainment infrastructure of the city. Nearby are discos, bars and nightclubs. This is a modern hotel in the city center located close to restaurants, bars, entertainment centers, boutiques and premium shops. The main feature of the hotel East is a huge swimming pool complex with the area of 6 thousand square meters. Here you can not only swim in the clear blue water, but also use the hydro-massage zones in different parts of the pool, cool off in the ice font or enjoy the SPA-procedures. 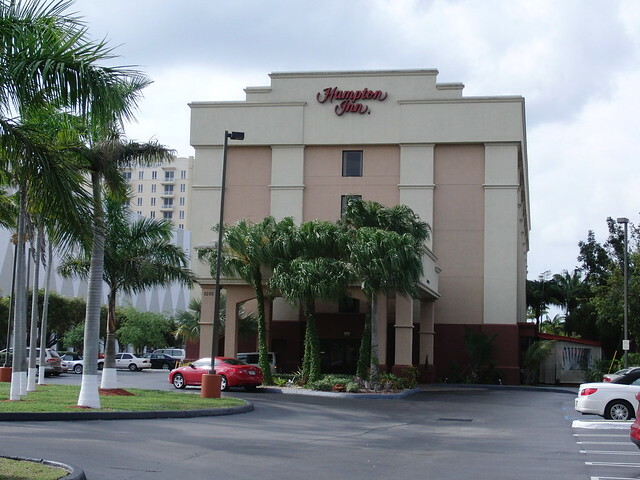 This hotel in Miami has many advantages that become decisive for tourists when choosing a place to stay. 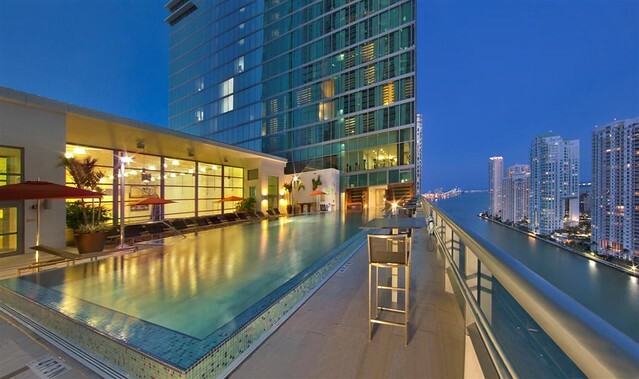 The 41st floor of the complex is the most popular place among holidaymakers – East Miami’s own bar is placed there. Also, the hotel has its own restaurant, in which, besides the usual American cuisine, you can taste Uruguayan dishes. The hotel is located in a high-rise modern building surrounded by boutiques, bars and entertainment centers. Rooms are quite spacious and you feel there like home. Light furnishing, soft shades in the interior and curtains in the country style creates special comfort. Visitors of the hotel can work out at the Hampton Inn & Suites by Hilton fitness center in the well-equipped gym, as well as use the services of the business center, which is located in the lobby of the first floor. For groups of tourists, the staff organizes various excursions and group trips to shopping centers. In the supermarket of this hotel in Miami, you can buy products and different goods. Coffee and tea are always available in the lobby.